1. Should I Shut Down My Pond in the Winter? We recommend that pond filters be cleaned. Depending on your situation, it may be necessary to shut down your pond for the fall and winter season. Every pond is different; some ponds can operate year-round and others should be shut down. When in doubt, ask The Pond Doctor. 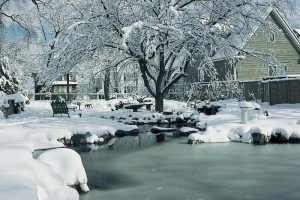 We can determine how to best prepare your pond for the cold winter season. 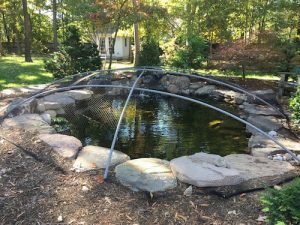 Most ponds should have a netting installed in the fall to reduce the leaves and organic debris that gets into the pond. It is not healthy for fish to have decomposing leaves in the pond. This debris creates poor water quality and can over stress the fish. All aquatic plants should be pruned and set into the deepest part of the pond. New growth will appear in the spring. Fall is also the season when aerators should be installed. You might also want to consider installing a small circulation pump to force water to the top of the pond. This provides extra oxygen for the fish and ensures a hole in the ice when it gets very cold. We advise our clients to switch over to a cold water bacteria to keep a healthy biological balance. Fish should be fed a cold water fish food until the water temperature is below 50 degrees. Once the water temperature falls below 50 degrees, do not feed the fish again until next spring when the water temperature rises above 50 degrees. The fall is a good time to consider any major renovations to your pond. The cool weather allows easier handling of fish and they do much better then when it is warm.